Last weekend, Pat and I headed out for an overnight trip to the state of Kelantan, Malaysia. This was where Pat did her Ph.D. field research back in the mid- to late 1970's, and where I was sent as a Peace Corps Volunteer right out of college. Our mission this time: to go and check out a performance of the wayang kulit (shadow play) in Kelantan. 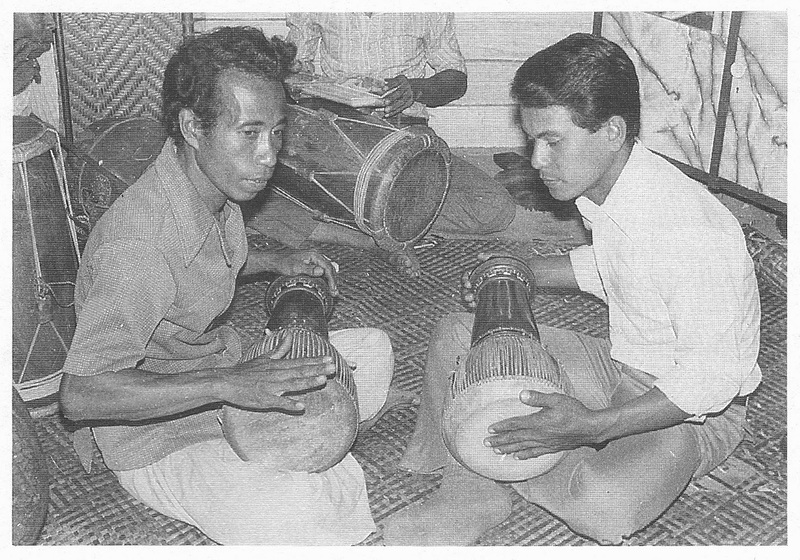 The Kelantan shadow play was the subject of Pat's research and Ph.D. dissertation in the 1970's. Pat's teacher, the master shadow play puppeteer (dalang) Hamzah Awang (pictured on the left ca. 1976 with drummer Mohammed Ali) passed away in 2001, and his son Rahim is now trying to carry on the tradition. Rahim (shown here in a 2010 photo with his wife Aini and kids --- who are much bigger now!) has gathered some surviving members of Hamzah's troup and is using his father's collection of instruments and puppets to perform when he has the time and can get the troupe together. Speaking to him, and listening to him play, you get the impression that dalang Hamzah is back among us! Among the old-timers in Rahim's troupe is Mohammed (Mat) Ali, whom you saw playing on the right across from Hamzah in the 1976 photo above. He is now retired from the police force, and is partially paralyzed in one leg from a stroke he suffered recently. 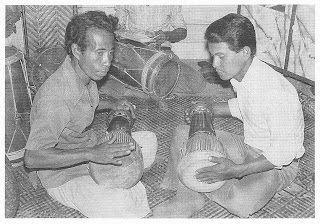 But whenever Rahim performs, and whenever other practitioners of the traditional arts (mak yong, main puteri, etc.) need a hand, Mat Ali will drag his bum leg and be there to help! By the way, play around with the map at the top to see where Kota Bharu is in relation to Kuala Lumpur. Use the zoom (+) and unzoom (-) buttons with the arrow keys to get a feel for the geography of Peninsular Malaysia! Pat and I set out of the Subang regional airport in Kuala Lumpur for a short flight to Kota Bharu. We flew on an ATR 72-500 short-haul turboprop plane on Firefly, a low cost domestic carrier. It was the Malaysian low-cost airline Air Asia that started the no-frills revolution in this part of world, shouting the slogan "Now Everyone Can Fly!" How prophetic! We rent a car at the Kota Bharu airport and drive into town to check in at the Crystal Lodge Hotel, a nice, modest little hotel on Jalan (street) Che' Su, almost right next door to the place that Pat used to rent when she was a grad student from U of Michigan at Ann Arbor. Pat was doing field research work, studying the music of the wayang kulit for her Ph.D. The house that Pat lived in is long gone, a "victim" of urban re-development. from her place to one of these floating docks that served as a terminal for the river taxis (speedboats) that would take her across the river, bicycle and all. On the other side, she would pedal the bike, field recording equipment and all, from Kampung (village) Laut to Hamzah's village of Kampung Gerong. At that time, there was no riverwalk --- just mud banks! On this trip, we're accompanied by Prof. Kathy Foley (left), a theatre arts professor from the University of California at Santa Cruz. Kathy is in Malaysia most of this year on a Fulbright grant to research Malaysian theatre. She is a specialist in the Indonesian puppet theatre. Pat is sharing her office at the University of Malaya with Kathy this year. After a sumptuous dinner of Kelantan-Thai dishes, we drive out to Kampung Kebakat, where Rahim has built a panggung (theatre) in his front yard. Rahim's day job is in the building trades, so he has built an all-weather, hi-tech panggung, with outside lighting, PA system, and an audio equipment room. A 21st-century village panggung! When we arrive, we briefly stop inside Rahim's house to say hello to Aini and the kids. The kids are now teenagers and are scurrying around getting the place ready for an expected influx of design and photography students from the MARA Institute of Technology near Kuala Lumpur, who are on a field trip to Kelantan. The students' lecturer is a friend of Rahim's, and the MARA Institute has underwritten the performance. While waiting for the students to show up, we look into the panggung and find the percussion players lounging around in the panggung waiting for the students to arrive. Rahim tells us that tonight's performance is special. In his previous performances, he has never performed the buka panggung (stage opening) ceremony because he never learned how to do it from his dad. But tonight, he has dug up another old timer from the villages nearby who knows how to perform the ceremony. This fella will coach him on how to perform buka panggung. And sure enough, the front of the panggung is already set up with plates of yellow-dyed cooked rice, boiled eggs, and other accoutrements for the ceremony. Note the puppets set into the banana tree trunks (which are very soft), ready to be used in the performance. Bye and bye, the students arrive. The bus drivers had gotten lost trying to navigate the dark streets in an unfamiliar area. The students immediately set up their photographic gear and start snapping pictures as Rahim welcomes them and briefs them on what they will be seeing tonight. Under the coaching of the old fella in the blue shirt, Rahim dons a shawl on his head and begins the buka panggung ceremony. He remembers seeing his father perform this numerous times, but the exact mechanics of the ceremony elude his memory. With the old-timer coaching him continuously, Rahim ably performs the rituals and recites the various prayers. Some students start to crowd the windows and snap photos, while others sit outside waiting for the show to start. Usually the wayang kulit performances are multi-night performances of some aspect of the Ramayana epic popular in India and SE Asia. Tonight, because of the limited time, one of the short cerita ranting (branch stories) will be told. The prologue common to all wayang kulit performances comes on screen as the demigods on the left and right descend on either side of the Tree of Life and the sage in the middle. Rahim, as the dalang, manipulates the puppets, ques the musicians, narrates the parts of all the puppet characters, sings the songs, and pushes the performance forward. With the symbolic forces of good and evil battling in the skies, the story can now proceed! The performance finally comes to an end way after midnight. The students troop back groggily to their buses, and the few remaining kids and neighbors go home chatting and laughing. Pat has spent the entire evening entrenched with her video camera in front of the screen, recording the performance. Kathy Foley spent the whole time inside the panggung with the performers, recording their activities. We stay to talk with the performers and Rahim after the show. Kathy orders some puppets from the local puppet-maker for her to take back to UC Santa Cruz for their museum. We finally drive back across Sungai Kelantan back to our hotel. We'll sleep well tonight! We sleep in some, then walk around town a bit the next morning before heading to the airport for the flight back to Kuala Lumpur. I have a feeling that Pat and I will be back to Kota Bharu to see Rahim and other performers from time to time. Pat's audio and video recordings of Rahim's father's performances and musical pieces will be invaluable for Rahim and his troupe to learn the pieces that he never had a chance to pick in bye-gone years... it'll be fun ! Hi there Howard. Great to know that both of you have gone down to your root. Kelantan is still Kelantan so I do not believe you do not missed many things. The Kelantanese are still a proud people with it's own culture that is distinct to the other part of Malaysia. I am glad both you and Pat get to meet some of the friends and watch once again the wonder of their Wayang Kulit. BTW did you get some of the patong that they use in the wayang. It is a great piece of artwork and worth keeping as a priceless piece of art. I am trying to get a good one when I next visit Kelantan. Have a nice day; salam to Pat as well. Hi, Pak Idrus! Yes, we have at least two sets, one smaller and one bigger, of representative patung wayang that Pak Hamzah made for me (the smaller set) and for Pat (the larger set) in 1978 or so. I need to take my set to Kelantan to get the puppets repaired. We know a good puppet maker, if you'd like to go and see him when you're in Kelantan next! Great stuff. We should join you for your next Kelantan outing!